FISHING gear manufacturer Hong Guan (Tackle) took a close look at the potential of Iskandar Malaysia a few years ago and was hooked. It happily took the bait in 2010 and moved in to set up a 15,000 sq ft warehouse that has become crucial to its ambitious expansion plans. "We took a chance as (Iskandar) was not popular back then, and the hype actually started in 2013," said managing director Lee Seng Shoy, who represents the fourth generation to work for his family business since it was set up in 1942. Mr Lee, who is the great-grandson of the founder, took the reins in 1997, the year he launched the firm's proprietary brand, Pioneer Tackle. The brand is now well known across South-east Asia and elsewhere, with sales in 25 countries, including South Africa and Australia. The products, which range from hooks and rods to reels and lures, are designed in Singapore but manufactured by third parties in China, Japan and South Korea. Mr Lee noted: "We can accommodate the respective markets that we serve and, most importantly, we are able to react to market changes very quickly because of our product development team. "Every piece of our core products is field-tested in real, hard fishing conditions and approved by our product development team before entering the market." Mr Lee, 41, moved to consolidate its warehouses in Singapore and Johor Baru to Iskandar, primarily because of "escalating rental costs in Singapore, which rose from under 70 cents per sq ft in 2003 to $2 psf in 2010". "It was better to find an alternative," he added. The higher foreign worker levy and shortage of labour were push factors as well. Iskandar appealed to the company on a number of fronts, particularly, the lower cost of property. "The price of the freehold warehouse in Iskandar is equivalent to five years' worth of the $15,000 monthly rental cost in Singapore," Mr Lee said. He also pointed out that basic infrastructure, such as highways and the electricity grid, "were already available back in 2010 amid many other ongoing construction projects such as Legoland and Traders Hotel". Cheaper labour was also a draw. "Given the same job role, the employee here draws 40 per cent less than in Singapore," said Mr Lee. The move to the new warehouse officially began in September 2011 and the company has since made $200,000 in annual cost savings, according to Mr Lee. From that time to December last year, revenue grew by 50 per cent to $15 million last year, prompting him to set his sights further. He plans to double the size of the warehouse to 30,000 sq ft within the next three to five years, as he expects to expand the business by 20 per cent year on year over the same period. But there are challenges as well. Mr Lee said the labour crunch in Iskandar is a big issue, as the region is 30km to 40km away from Johor Baru. That has forced him to increase wages by 20 per cent to 30 per cent to entice workers to travel the distance. The firm's total headcount of 45 includes 13 in Iskandar, ranging from warehouse assistants to sales and operations personnel and a senior manager. And pursuing that goal of 50 per cent revenue growth over the next three to five years has meant that Mr Lee had to make tough decisions when undertaking a major restructuring exercise last year. "It was the first time in 17 years that I had to ask people who were not aligned with the company goals to leave," Mr Lee said. 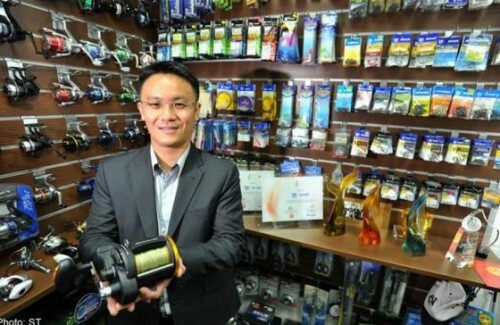 But he feels that the moves are crucial if the Singapore-headquartered company is to achieve its aim of becoming the biggest distributor of fishing tackle in South-east Asia by 2017.